I've started again with organising smaller events about bluegrass, namely a Bluegrass Outlaw Party on 2 February in Club Heidegger, Grote Kerkplein 70, Rotterdam. 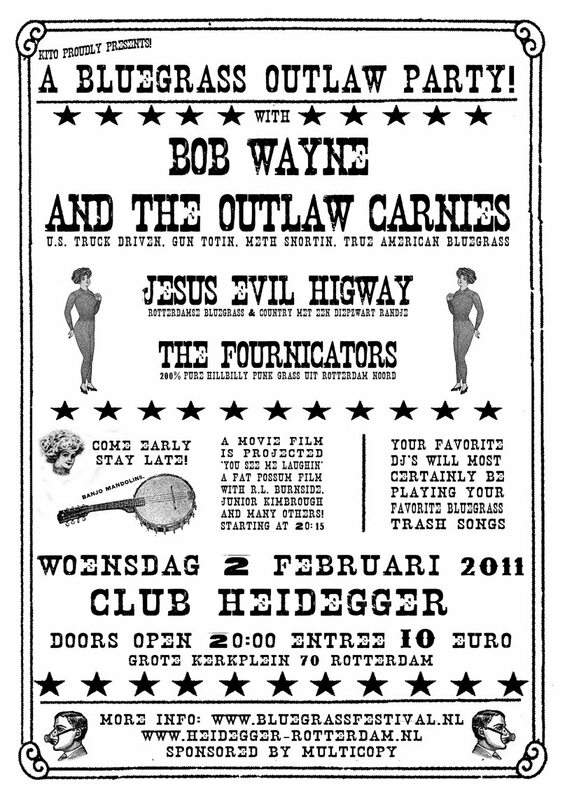 I would like to invite you and EBMA members to come and enjoy Bob Wayne and the Outlaw Carnies (USA), Jesus Evil Highway (NL), and the Fournicators (NL), three bands that mix bluegrass, country, hillbilly, and rock 'n' roll but have a strong bluegrass basis. The doors are open at 20:00; entree is €10. There's more info online, but most of it is in Dutch. If you are interested, I can send you more English information.